Captain Jack's Alder Smoked Alaskan Salmon Fillet has a sweet smoky flavor that is terrific by itself, mixed with cream cheese to make a dip or spread, or used to add bold flavor to salads and pastas. 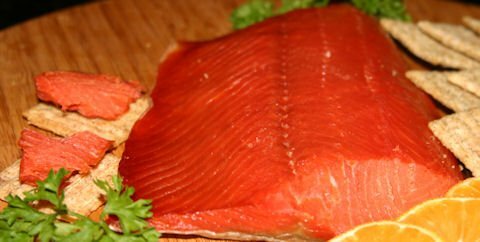 Our Alaskan smoked salmon is made with the highest quality ingredients. This process begins with chrome-bright wild sockeye which is locally harvested and picked up right off the dock. The salmon known for producing the most rich, flavorful smoked fish. From there, the Captain Jack's hot smoking process fully cooks the fillet making it ready to eat! Shortly thereafter, we vacuum seal and blast freeze the fillets to preserve their rich flavor. Packaged for sale in approx. 1/3 lb. portions. FedEx Priority Shipping included. Additional fee for Hawaii locations. You can earn 38 JACKpot Points! on this product!